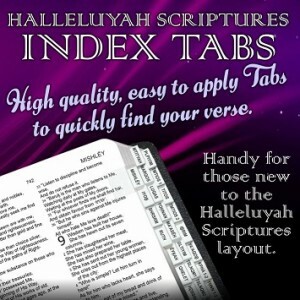 HalleluYah Scriptures Bible Tabs are here. We are excited to share that we have finally completed the HalleluYah Scriptures Bible Tabs for you to use in your HalleluYah Scriptures. For those new to the layout of these Scriptures, you will be able to find the Books you want by using these tabs to mark each book in the HalleluYah Scriptures. These are white with a lovely silver trim and use the HalleluYah Scriptures transliterated names on the tabs. It is good to be able to start to use the real Hebrew names in the HalleluYah Scriptures as the names in most cases were given by our wonderful Father YHWH. These tabs are easy to apply without measuring etc. Simply start from the back sticking them on and work to the front - easy! We offer these at cost including shipping but if you feel led to donate more, we can use the funds to help the very poor and needy to receive your gift freely. Giving a free gift of the HalleluYah Scriptures His Word is the best gift you can ever give another believer, as it is treasured for life and it has all the answers, giving comfort and joy in times of need. There truly is nothing more important after our salvation than His Word. Order your set today and enjoy adding them to your Halleluyah Scriptures. The cost is around $25.00 including shipping. "Please enter only amount in numeric value without any Currency Symbol." After submission of form you will be taken to PayPal to complete your donation.